SAN FELIPE, MEXICO (AFP) - The dried fish parts do not look like much to the novice eye, but the totoaba swim bladders discreetly displayed in this shop in Guangzhou, in southern China, sell for up to US$20,000 (S$26,300). Half a world away, off the coast of Mexico, poachers battling each other for this "cocaine of the sea" are using drug cartel-like tactics to get it - pushing two species towards extinction and leaving ordinary fishermen fighting to survive. The lucrative black market for totoaba swim bladders - prized in Chinese traditional medicine for their purported healing and beautifying properties - have turned the Gulf of California into a battleground, criss-crossed by armed poachers, Mexican navy vessels and environmental activists patrolling with pirate flags. The casualties of this war include not only the critically endangered totoaba, but also the world's smallest porpoise, the vaquita marina - of which just 30 remain, according to scientists - and local fishermen caught in the middle. Three years ago, the Mexican government declared a ban on fishing in a 1,300-sq-km area off the coast of San Felipe, a fishing community that depended on the industry for 70 per cent of its economy. "They're pushing us into it whether we want to or not. It means risking your life, but if you don't have any money, what else can you do?" he said. 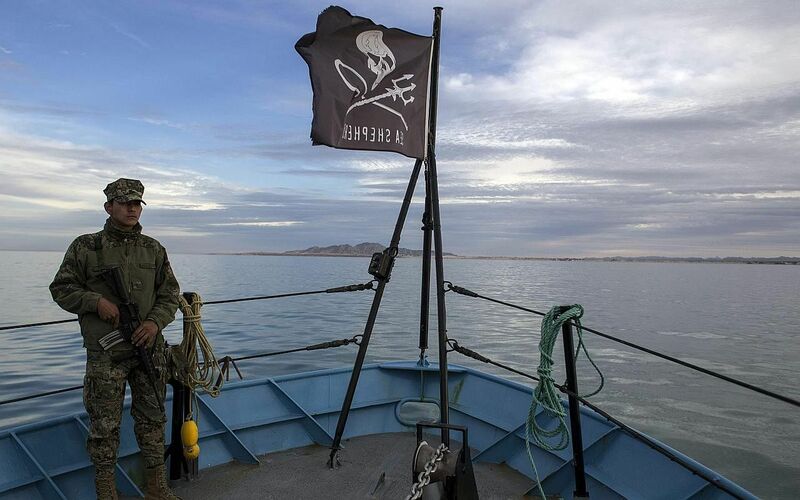 Flying a black flag with a white skull, activists from the US environmental group Sea Shepherd patrol the waters off San Felipe night and day in a camouflaged ship, using sonar and radar to find poaching boats and their nets. It can be a dangerous hunt: poachers have been known to open fire on Sea Shepherd drones, and the authorities say they are operating increasingly like Mexico's powerful and brutal drug cartels. "They go to sea armed, and there are shootouts between rival groups," a Mexican marine deployed to the zone told AFP. Since February, Sea Shepherd has carried armed soldiers and police aboard its ships, for the activists' protection. The authorities say poachers filet the totoaba at sea, stash the swim bladders in hidden compartments and toss the bodies back into the water. Then they ship their haul in small quantities - the same strategy used by drug cartels. Mexican authorities have begun using the same tactics they use against cartels: tapping phones and following the money trail to pick apart the organisation. "It's highly likely" the poachers are funded by drug cartels, said Joel Gonzalez, an official with Mexico's prosecutor for environmental crimes. Fishermen in San Felipe confirm as much. "It's the same mafia, the same corrupt networks and the same trafficking routes" for drugs and totoaba, said one, speaking on condition of anonymity. In the faraway city of Guangzhou, in a shop on a busy street, a soft-spoken saleswoman shows an undercover AFP reporter her collection of dried totoaba swim bladders, fetched from a store room upstairs and carefully laid out on a wooden table. The prices range from 20,000 yuan (S$4,200) to 130,000 yuan. "We can give you a display case with a ribbon and gold silk setting," she says. Totoaba is reputed to rejuvenate the skin and heal a host of ailments, from arthritis pain to discomfort during pregnancy. But it has become so rare that most customers just display it in their homes, "because it is a prized item", the saleswoman says. In all, her collection of eight dried totoaba pieces is worth US$80,000. Back in San Felipe, the leader of the local fishermen, Sunshine Rodriguez, recently went on hunger strike for 10 days to protest the government's blanket ban on fish nets - even though only one kind of net is responsible for killing the vaquita, according to the fishermen. Manuel Galindo, an oceanographer with 37 years' experience, agrees: he says only the thick nets used to fish totoaba can kill the vaquita. The real reason the porpoise is dying out, he says, is that too many dams have been built on the Colorado River, in the United States. That has reduced the flow of water it deposits into the Gulf of California, increasing the salinity of the vaquita's waters, reducing the temperature and disrupting its food supply. The vaquita is adapted to a very specific environment, and those conditions "don't exist anymore", says Galindo, a retired professor at the Autonomous University of Baja California. 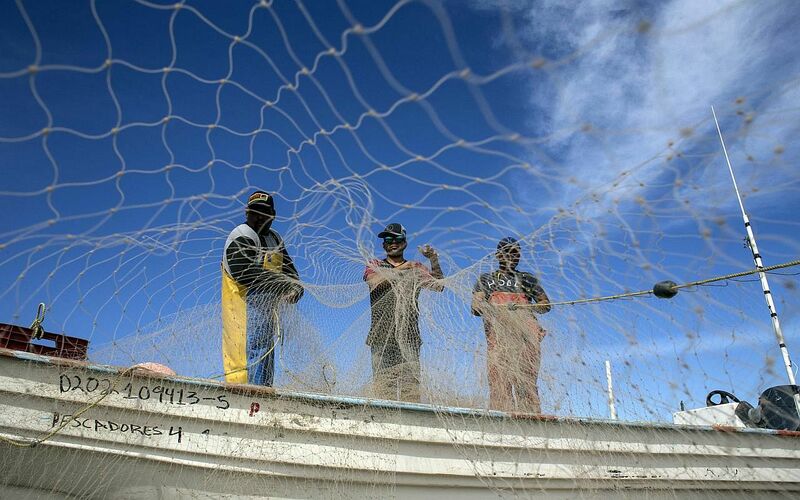 San Felipe's fishermen are also struggling to survive in their new environment. About 200 of them have abandoned the town and set up an improvised camp on a remote beach with no running water or electricity - one of the only places they are now allowed to fish. "We've had to flee all the way this place, where we're cold, where we have nothing," says Maria de la Paz Alcantar, 60, cooking lunch for the fishermen as two little girls play in the tangled nets on the sand.